According to the new statistics of the World Health Organization (WHO) Glaucoma is the second important cause of blindness as the world's population ages. This concise guide describes the state of the art glaucoma surgery as performed by leading glaucoma surgeons. Written with a reader-friendly and homogenous structure, each chapter starts with key tips, offering advice on pre-operative considerations and step-by-step guidance for all surgical procedures. It also includes tips on how to avoid complications as well as the management of post-operative complications. A notable feature of this text is the companion DVD featuring videos of the most important surgeries and selected complications. Readers will be able to see the experts perform routine cases, and watch as they react to the unexpected events that glaucoma surgery may bring. 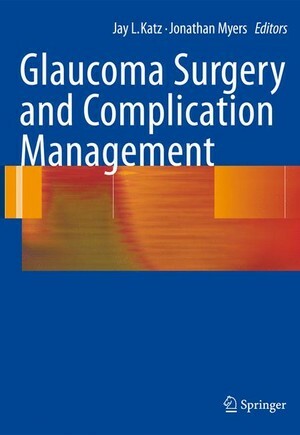 The straightforward approach, ample illustrations, and detailed suggestions for avoiding complications make this text useful for all physicians currently performing glaucoma surgery, from general ophthalmologists to fellows and established glaucomatologists. The Decision For Surgery: When to do surgery and communication with the patient. - Pre-operative Considerations. - Iridectomy/Iridoplasty. – Trabeculoplasty. - Trabeculectomy Technique. - Antimetabolites, Viscoelastics, and other tricks of the trade. - Post-Operative Mannagement. - Combined Phacoemulsification and Trabeculectomy. - Phacoemulsification Considerations in Glaucoma Patients. - Non-penetrating Surgeries. - Tube Shunt.- Ciliary Ablation. - Angle Surgery. - Bleb Revision: High Pressure. - Bleb Revision: Low Pressure. - Management of Choroidals and Shallow Chambers. - Investigational Surgeries.